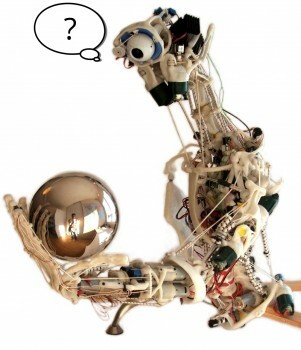 But of course, the most interesting question is this: How could we build a conscious machine? And the simple answer to that is: By trying to. Not by building an artificial intelligence and hoping that consciousness appears as a by-product, the way non-stick frying pans were supposed to be an incidental consequence of the race to the moon. Not by creating a vast and necessarily inaccurate 'neural' simulation of a mammalian or human brain, and hoping that it turns out to be conscious - in the present incomplete state of knowledge this is a very faint hope. Not by waiting for the internet to spontaneously become conscious - it won't. Not by picking a necessary quality of consciousness and assuming it will be a sufficient basis for a conscious machine. And certainly not by sitting around arguing about whether such a machine is or is not possible, or what it would or would not be able to do, or how it should or should not be tested, or whether it would or would not show certain characteristics of human consciousness, or whether it could or could not be implemented using digital technology, etc. etc. We believe that machine consciousness can and will be achieved, and we're going to try to do it by approaching it directly. Like the Manhattan project, or the decoding of the human genome, it's essentially an engineering task that needs an exceptional and unwavering degree of focus on the final goal. As to whether it's a prohibitively difficult engineering task, no-one knows yet, but there are no indications that it needs any technical resources that aren't already sufficiently well developed. Of course, conscious machines will be scientifically, technically, socially, legally, and philosophically disruptive, but will they also be economically disruptive? Probably...but perhaps no more than any other billion dollar business. While we don't (yet) have the human or financial resources of a Google or Facebook or a major research institution, we don't have their commercial, organisational, or cultural pressures either. This gives us the complete freedom of thought and action that will be absolutely necessary for the success of the enterprise. We have already exercised this freedom in deciding that the best available point of departure will be within the field of robotics (although this does not mean that our long-term vision is limited to conscious robots) and so the best business and technical environment for the project's development will be a leading technology incubator specialising in robotics. And that's why on March 21st we started setting up in the Bristol Robotics Laboratory Technology Business Incubator - more news and a more informative website soon! PS - and if you're curious about the robot pictured at the top of the page, it's CRONOS, developed in 2005 as part of the UK EPSRC funded project 'Machine consciousness through internal modelling' - the first and still one of the very few funded research projects on machine consciousness (http://cswww.essex.ac.uk/staff/owen/machine/mchome). You can see CRONOS, along with its European descendant ECCEROBOT (http://eccerobot.org/) in the London Science Museum Robots exhibition until September 3rd, and thereafter on the exhibition's UK and world tour.